Last week, Ilya reviewed the Sinn 103 Ti UTC IFR. A high-flying model that was specially tuned to pass the most rigorous requirements for a true pilots watch. Today, I’ll be taking a look at a watch meant to go the other direction, down deep. 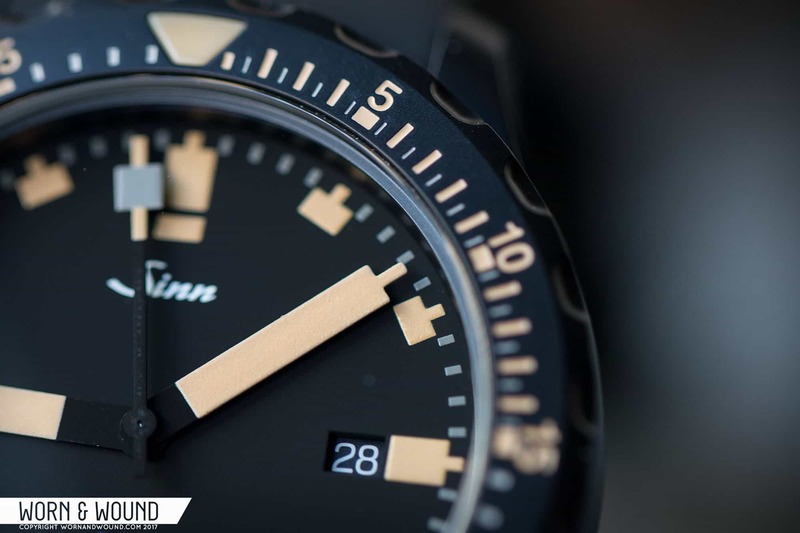 While Sinn might be known for their Pilots watches and chronographs (the brand was founded by a pilot after all) their dive watches are equally as impressive. We have looked at one before in fact, the EZM 13 chronograph. But while labeled a dive watch, it bares a lot in common with the 103 line aesthetically, ending up not having that “traditional” dive watch feel. 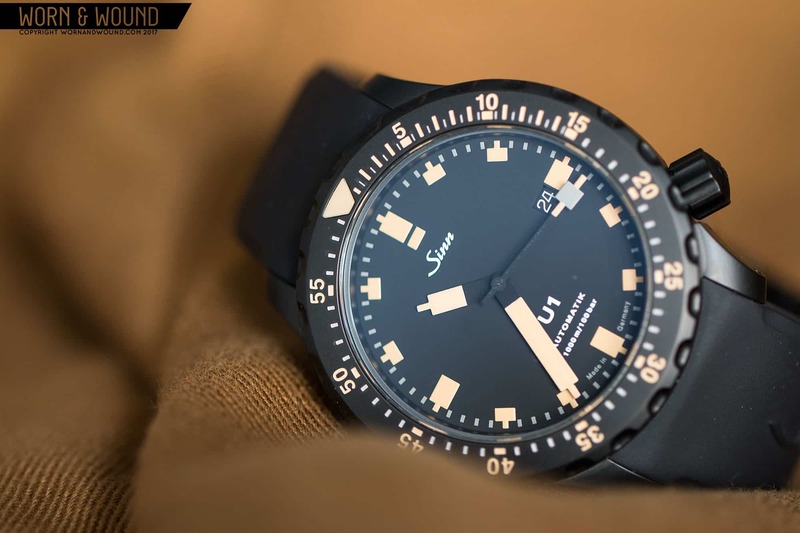 So today I’m taking a look at the newest version of Sinn’s quintessential diver, the U1 S E.
Labeled “the diving watch made of German submarine steel” the U1s are a group of super tough 1000m divers with distinct blocky markers that have earned a serious cult following. The U1 is available in several styles at any given moment, and has come in a variety of highly collectible limited editions. Late in 2016 at Munichtime, Sinn introduced the newest iterations, the U1 S and U1 S E, the latter of which features a more stylized aesthetic based on the highly popular, but long sold out, U212 S E. Now in all black, fully tegimented submarine steel with “ivory” colored lume, the U1 S E has a distinctly sleek, stealthy look to it. One that mixes the diving aesthetic of the watch with something land based and military. The U1 S E is available on a silicon strap for $2,390 or a fully tegimented submarine steel bracelet for $2,520. Before the U1 arrived, I was a bit concerned with the size. At 44 x 50 x 14.8mm, it’s a large dive watch. However, in person it looks more compact and well proportioned than the dimensions describe. In fact, I had to double check that it was 44 as it reads closer to 42mm. Regardless, it’s a beefy watch, for sure, but one that doesn’t seem like it’s big for the sake of being big. The case design is very well thought out, giving it an overall balanced feel as well as downplaying the height. From above, you have long tapering lugs protruding from a mid-case that is hidden under a fairly striking bezel. The bezel is wide and made of solid metal, no insert. The top edge features a shallow bevel that creates a nice visual separation between the marker and grip regions of the metal. Instead of teeth, the bezel has wide notches that give it a more modern look. 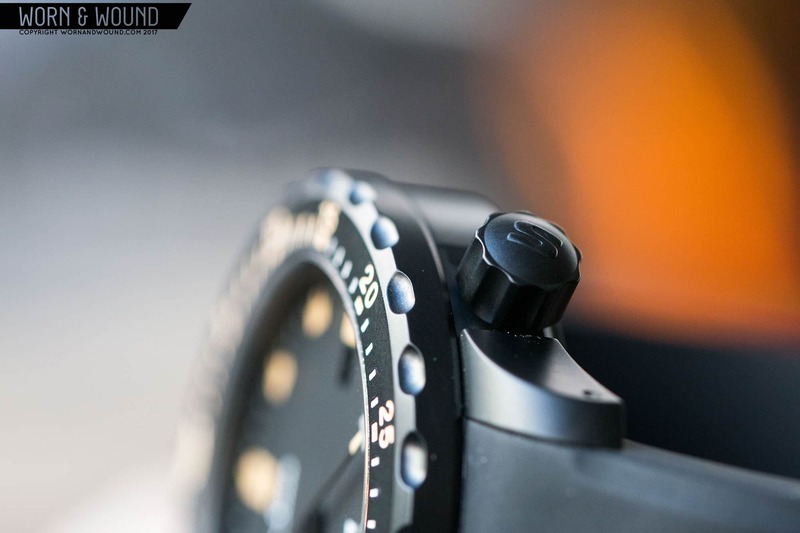 In terms of mechanism, the bezel is 60-click and uni-directional, featuring their “captive” design, which prevents the bezel from being knocked off. The mechanism has a bit of a looser feel than I expected, though I believe this is common with Sinn’s dive bezels. When turning, it pops into place but has some give forward. I recall the EZM 13 felt the same way. It’s not a deal breaker, and certainly isn’t a product of bad manufacturing, but still doesn’t have that reassuring click I desired. Looking at the case from the side, you can see how Sinn cheats the height a bit. The mid-case looks thinner than it actually is, because the bottom edge has been milled away, moving some of the mass underneath. On top of it you have the bezel, which stands a few millimeters thick, and underneath, a domed solid case back. Because of the milled out portion, the case reads closer to 11mm than 15mm. Additionally, the lines created by the bezel, the undercut, etc, help break things up. On the right side of the case you’ll find the 7mm screw-down crown is offset to 4 o’clock. This off-center positioning goes a long way towards making the U1 wear more comfortably and also look a bit smaller. You’ll actually find that all of Sinn’s dive watches, even smaller models, have offset crowns or left side crowns to increase comfort. A Sinn wouldn’t be a Sinn without some tech, and for the U1 S E what you have are some interesting materials. 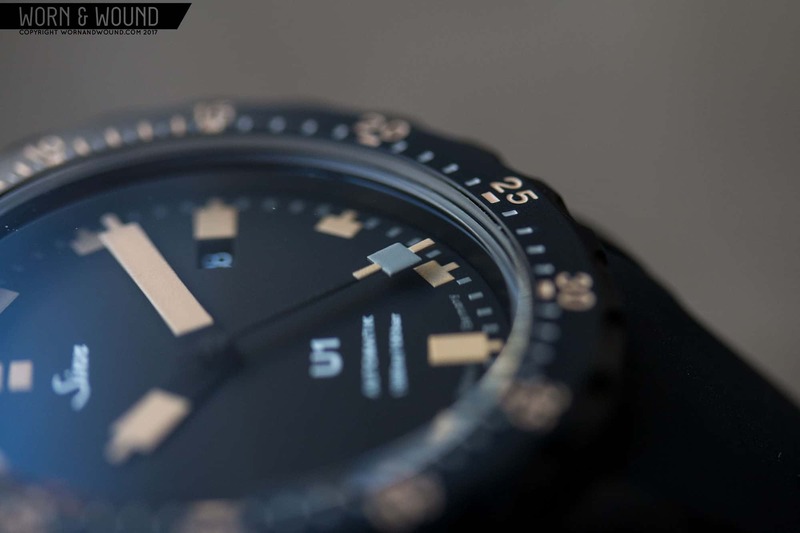 The case is made out of tegimented submarine steel with a black PVD coating. So, two things to look at here. First is tegimenting. This is Sinn’s proprietary hardening technology which brings their cases up to 1200 vickers, a few times harder than normal 316L. This helps prevent scratching and wear, thus keeping your watch looking nice and new. The other is the use of submarine steel. Now, this doesn’t mean it was cut from a submarine, rather they use the same alloy that subs do. This alloy is highly anti-magnetic as well as corrosion resistant. Both are important for dive watches, with the latter helping the watch resist salt water. 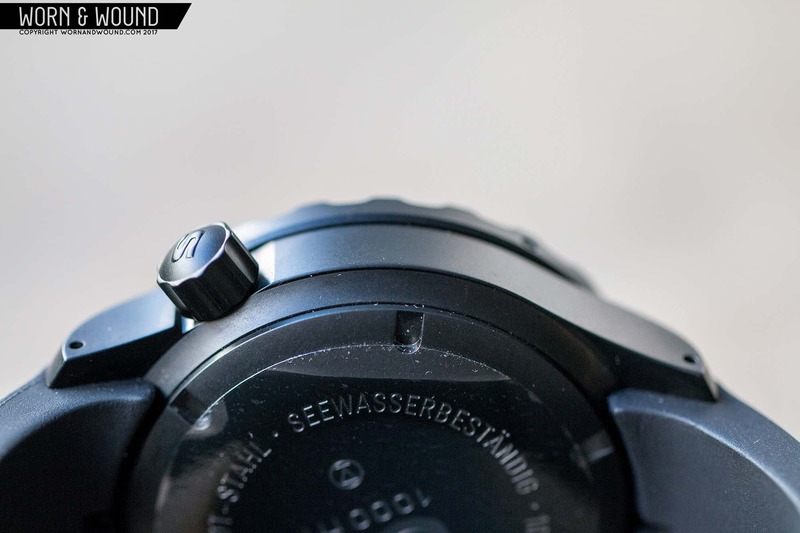 Combine tegimenting with sub-steel and you have a pretty perfect recipe for a tough dive watch. It’s worth noting that while all U1s use sub-steel, not all are tegimented. 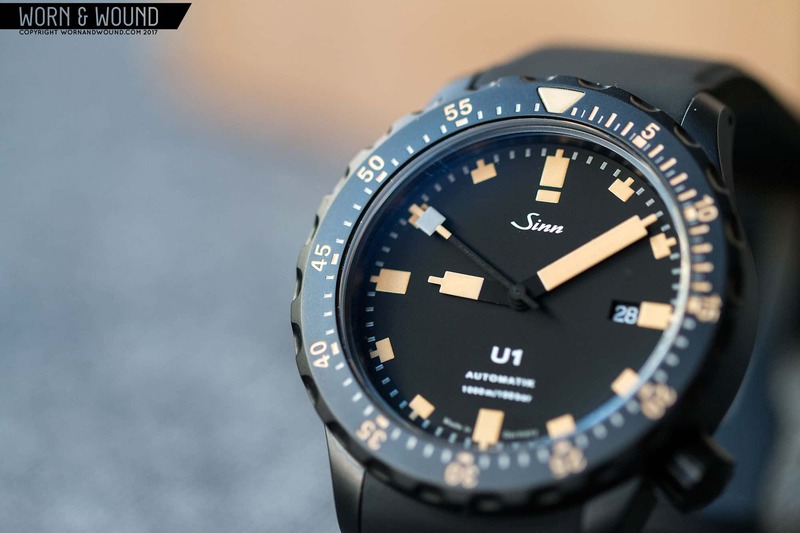 The PVD coating is then an aesthetic addition, but one that Sinn makes sure is highly scratch resistant. In fact, they call it “black hard coating” not PVD. On the U1 it looks great. The metal already has a sort of satin sheen that takes very well to the coating. The black then both makes the watch look more aggressive and a touch smaller, which doesn’t hurt. The U1 dial stands out in Sinn’s collection, as well as from dive watches in general, with a restrained, modern vocabulary. In Sinn’s line, there isn’t any other dial and handset that resembles the U1. It’s not a part of their EZM (mission timer) series, which most of the rest of their dive watches are. This makes the U1 kind of a fun aesthetic anomaly. Getting into it, it’s actually a very simple and clean dial that uses small, but bold markers for good effect. The dial surface is matte black on which you have an hour index of wide but short blocks that get longer at 3, 6, 9 and 12. The 12 marker has an additional block underneath it, giving it more presence. On the S E model, these markers are printed in a matte “ivory” color. That’s Sinn’s choice of words, to my eyes it’s warmer and darker than that, sort of a pale ochre. Regardless, it’s an attractive color that jumps off of the black. It’s also lume, glowing acidic green with a charge. It seems to be decently bright, and lasts a moderate amount of time. In between the hour markers are then small grey minute markers, rounding out the dial and adding legibility. The play between the black of the surface, the ochre hour marks and gray minute marks is very thoughtful, giving clear emphasis to the hours, then the minutes. The color also just look good together. One interesting and distinctive detail of the U1 is that the hour markers connect with the 5-minute markers, creating these funny little lego-block-esque shapes. They’re quirky but attractive and give the watch a more approachable feel over Sinn’s more intensely military looking pieces. At 3 you have a date window along side the hour marker. The date disk is black with white text, maintaining a low profile on the dial. Just below 12 you have the Sinn logo in white, and above 6 you had “U1”, “Automatik” and “1000m/100bar”. The text is kept fairly small and considering the large amount of negative space on the dial, is a welcome break. Due to the lack of numerals on the dial, you’ll likely use the bezel for a quick reference. The divers bezel features milled in marks that correspond to the colors of the dial, virtually extending the dial to the edge of the watch. At 12 you’ll find a lume filled triangle with a blunted tip. Following this, you’ll find ochre markers for the first 15 minutes with numerals every 5. The rest of the bezel follows suit with ochre numerals and gray marks for the individual minutes. The only thing I was surprised by was the limited amount of lume. Only the triangle glows, which feels a bit lacking and like the numerals on the bezel should glow too for legibility in the dark. The hands of the U1 are unmistakable. Both the hour and minute hands take the lego block shape and extend it to hand length. Both are very wide, flat and nearly paper thin, with the hour being substantially shorter to keep them visually separated. For the S E model, the hands are matte black towards the center of the dial and then edge to edge ochre lume after. These hands really pop and give the watch great legibility. Not to be out done, the second hand is quirky as well. It’s a stick with a large square towards its tip. The square is in matte gray, matching the minute/seconds markers on the dial, which bisects an ochre region before becoming matte black. In the dark, the two ochre lines glow, but the gray does not, giving it sort of the opposite arrangement from most second hand tips. The U1 S E shown came on a thick silicon strap. It’s a fully custom molded strap that form fits the lugs for a clean, seamless look that works especially well with the all-black colorway. The strap is very thick, measuring 5mm+ depending on where measured. Honestly, while comfortable after getting used to it, it is a bit thick for my tastes, sometimes not fitting well under a shirt sleeve. That said, it does look properly overbuilt for the watch. The strap is finished with a very heavy duty expandable deployant buckle, also made of tegimented, black hard coat steel. Straps like this always have the unfortunate situation of being cut to size. While this allows for a custom fit, it’s very unforgiving and should you find yourself in between sizes (I, for example, found it a bit too loose after cutting down to size, but also think cutting another section could make it too tight, thus ruining the strap) you’ll be out of luck as there is no micro-adjustment on the buckle. Though $130 more, I would personally spring for the bracelet if considering this watch. On the wrist the U1 wears much better than I expected. As said, I actually thought it was smaller than it was, and measured to double check. Despite being 44mm it feels tame, and relatively compact. Of course, that’s relative for a big watch, which it is, just a tolerable one. I prefer dive watches in the 40 – 42mm range as they tend to fit my 7” wrist more appropriately. 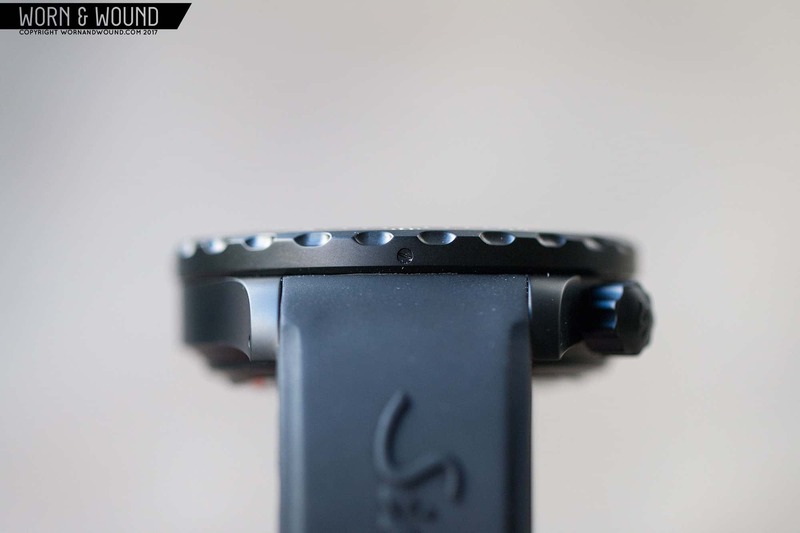 The 50mm lug-to-lug helps as well, keeping the watch on top of the wrist, and as discussed, the tricks done with the case design from the side make it feel thinner. Aesthetically, it’s a very cool looking watch. It’s aggressive and striking, but still somehow understated. It does a lot with a fairly limited array of shapes and marks. There is a substantial amount of open space and specifically on the S E model, a lot of black. Perhaps it’s this somewhat reserved execution that gives it that essential instrument feel that Sinn watches are so known for. It’s stylish but reads like a watch meant for a purpose. The black and ochre coloring then adds an earthiness to it that is very enjoyable. It might be a bit less technical looking than its steel counterparts with their red highlights, but gets the point across nevertheless. There are really two things to sum up in this conclusion, thoughts on the Sinn U1 in general, and thoughts on the new S E color. Starting with the former, I fully understand why the U1 is considered a classic Sinn and is one of their best selling models. 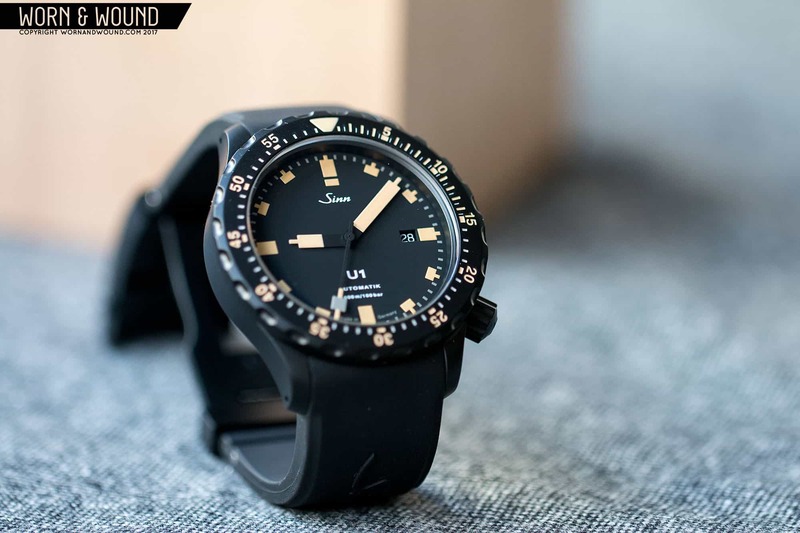 With all of the oversized, over decorated dive watches out there, the U1 comes in with it’s unique markers, sleek design and 1000m water resistance and says you don’t need the bells and whistles to be a serious dive watch. Sure, it’s still large, but it’s quite wearable for the size and has enjoyable, if not sober aesthetic. The S E edition then brings a more stylized approach to the palette for the U1. The mix of black, ochre and a touch of gray works very well. If you longed for the U212 S E, which was also a 47mm beast, this will get you very close. That said, looking at the various models side-by-side, I find myself most drawn to the U1 SDR model, which mixes a steel case with black bezel. It has a tegimented bezel but not midcase, which is a drawback, but the mix of finishes and red and white combo is just very appealing. With the various options, it should be easy now to find the one that suits your specific tastes. With a price tag of $2,390 a shown, the U1 S E isn’t cheap, but like with all Sinns, you are getting a lot for your money. For more information, visit Sinn. To purchase, visit WatchBuys.